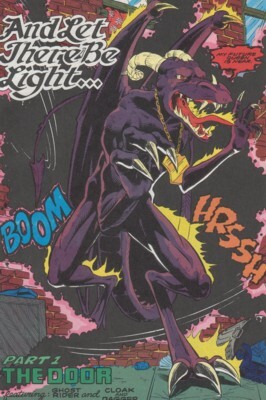 Powers/Abilities: Grimbat possessed superhuman strength (unknown level), the ability to fly (wings), and sharp talons he could use as weapons. He was able to hypnotize others through eye contact. With his fiery breath he could open portals to other dimensions. After being empowered with light he got the ability to transform himself into anything he wanted. (Marvel Comics Presents I##120/3 (fb) - BTS) - Again and again Grimbat took people with light powers to Zianon and made them use their powers for Zianon's people until they died from exhaustion. (Marvel Comics Presents I##121/3 (fb) - BTS) - Grimbat abducted Melnoa and married her. (Marvel Comics Presents I##122/3 (fb) - BTS) - Grimbat convinced Melnoa to use her light powers for Zianon's people. One day she disappeared and Grimbat thought that she had died by exhaustion like all the others before her. (Marvel Comics Presents I##119/3 (fb) - BTS) - On his search for Melnoa's successor Grimbat watched Dagger from Zianon. (Marvel Comics Presents I##119/3) - Grimbat came through a portal to Earth near his future queen Dagger. He abducted Dagger and knocked out Cloak and an innocent bystander who stood in his way. Grimbat returned with Dagger to his realm. A short time later Grimbat sensed another light being on Earth near the location where he found Dagger. He returned to Earth and abducted Ghost Rider ,too, who had come to this place because innocent blood had been spilled. Cloak held on to Ghost Rider's bike, and together they were brought to Zianon by Grimbat. (Marvel Comics Presents I##120/3) - In Zianon Ghost Rider and Cloak attacked Grimbat. 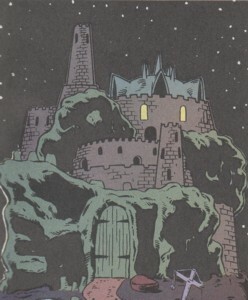 Cloak teleported himself and Ghost Rider to Dagger's side within Grimbat's castle. Zianon's ruler followed them with some creatures that chained Ghost Rider and Cloak. Grimbat hypnotized Dagger, and she came to him while Ghost Rider and Cloak were imprisoned. Grimbat gave Dagger beautiful clothes and jewelry and asked her just to do what was natural for her. She understood that Zianon's people needed light and she gave it to them. (Marvel Comics Presents I##121/3) - Grimbat attacked Ghost Rider and Cloak, who escaped from prison, and Dagger, who wanted to leave Zianon as well. Grimbat grabbed Dagger and was surprised that she knew that she was nothing more than a slave in a gilded cage. He was even more surprised when his old queen Melnoa entered the room and told him to free Dagger. Dagger freed herself from Grimbat's clutches with her light, and Grimbat got knocked out. (Marvel Comics Presents I##122/3) - Empowered by Dagger's attack Grimbat was now able to transform himself into anything he desired. He grew two additional heads and attacked the stranded heroes again. Ghost Rider fought back and used his penance stare on Grimbat, but Zianon's ruler didn't believe that his doings were wrong. Melnoa told Grimbat that the outsiders were right and Grimbat still couldn't believe that she was there because he had thought her to be dead. Distracted by Melnoa, Grimbat got consumed by Cloak, and when Cloak released him again Grimbat finally knew that his ways to help Zianon were wrong. He still wanted to help Zianon, but this time he wanted to sacrifice himself. Grimbat opened a portal to Earth for Cloak, Dagger, and Ghost Rider. Then Melnoa and Dagger empowered him even more with their light and Grimbat flew to the sky above Zianon and turned into a sun. From this day on Grimbat stood above his people and gave them the light they needed. Comments: Created by Paula Foye, Alexander Morrissey & Ken Branch. Many people on Zianon wore necklaces with this strange symbol (seen on Grimbat's and Melnoa's pictures). Does this symbol have any background or was it just made up for this story? Just from my head I could think of some people who could've become targets of Grimbat: Dazzler, Lightmaster, Photon, Firelord, Nova (Frankie Raye), Human Torch, Living Lightning, G-Type, Lightbulb Boy (who?) and many many others. One race on Zianon looked like E.T. the Extra-Terrestrial from Spielberg's 1982 blockbuster. (picture to the right) Could Zianon be the home of ET? I don't know if the other Zianons were inspired by outer sources too (most likely yes), but at least this little fella was familiar to me. Melnoa was a woman from an unknown dimension with similar powers as Dagger. She could project an orange looking light beam from her hands. (Marvel Comics Presents I##121/3 (fb) - BTS) - Melnoa was abducted by Grimbat and she became his wife and therefore Zianon's queen. (Marvel Comics Presents I##122/3 (fb) - BTS) - She was convinced by Grimbat to use her light powers for Zianon's people. She was drained by all her powers and went into hiding to regain some of the power she once had. (Marvel Comics Presents I##121/3) - Melnoa came to Dagger's room where Emmadidin and other servants dressed her. Melnoa told the servants to leave and talked to Dagger alone. 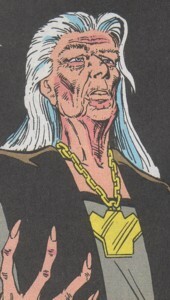 She warned Dagger that Ghost Rider and Cloak were not free, gave her the key to the labyrinth leading to the prison, and told her the way to get there. Later Melnoa spoke from the balcony in the castle's main hall and told Dagger and her friends that she was the bride of Grimbat. (Marvel Comics Presents I##122/3) - She told the earthly heroes that their fight against Grimbat had barely begun. She distracted Grimbat with her lone appearance. She told him that he had to face his errors and told him her story since she had disappeared. After Grimbat finally realized that his doings were wrong, Melnoa empowered him with Dagger's help until he could transform himself into a sun for Zianon. Melnoa gave Dagger a crown to remember her time on Zianon. Melnoa stayed on Zianon and looked into the sky with Zianon's people where their new sun gave them light. It was a dark planet without a sun. 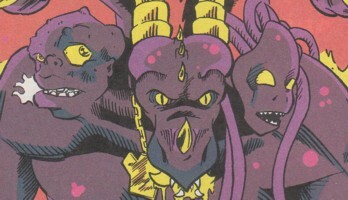 Grimbat's was the ruler of Zianon who brought different light bringing beings to his planet over the years. Zianon finally got a sun with Grimbat's sacrifice and the help of Melnoa and Dagger. There seemed to live many different races on Zianon. (Marvel Comics Presents I##120/3) - Dagger fed a group of citizens with her light. They called her their new queen, and she wanted to know what Grimbat did to Cloak and what this place was. Later a group of armadillo-like creatures chained Ghost Rider and Cloak when they tried to rescue Dagger. They were brought to prison where another creature told the heroes that they were not the first Grimbat had taken to Zianon, but Dagger's light was so powerful that Grimbat would never have to take another life. He explained to the heroes that Zianon's citizens needed Grimbat to bring them light in a manageable form for them to absorb. (Marvel Comics Presents I##121/3) - The prison guard couldn't stop Ghost Rider and Cloak when they fled and only begged them not to take Dagger away. The heroes fought there way through the labyrinth below Grimbat's castle. Some Zianons tried to get to Ghost Rider's light. One climbed into Cloak and Cloak felt a darkness that was even too much for him. Meanwhile Emmadidin and other servants clothed Dagger with jewelry and garb until Melnoa send them away. After that Dagger went through the labyrinth followed by light hungry Zianon's. (Marvel Comics Presents I##122/3) - After Grimbat sacrificed himself to become the sun of Zianon many Zianons joined Melnoa to see the first daylight in their life.